You are currently browsing the Gluten Free For Good blog archives for March, 2009. I love duck eggs. They’re becoming the answer to all my problems (other than my dwindling bank account, the fact that my favorite jeans are too tight, and the 18 inches of snow in my yard). If nothing else, they’ve raised my gluten-free baking to a whole new (and quite stellar) level. Check here for more detailed information on duck eggs. And if you’re a egg protein scientist and you happen to stumble across this blog, please contact me. I’m interested in why duck eggs seem to be a perfect match for gluten-free baking. It must be the amino acid composition. Dave — world renowned quirky (seriously quirky) but brilliant molecular bio-scientist from Montana — why do duck eggs work better than chicken eggs when combined with non-gluten grains? *Dave (Dr. Sands) is committed to the development of nutrient-dense agricultural food sources for human consumption. He also has an academic and personal interest in nutrition, alternative grains (gluten-free), humanitarian aid, sustainability, local agriculture and poetry. In his spare time he plays with airborne bacteria capable of ice nucleation. Remember, I said quirky. Seriously quirky. But I digress, which is common. Back to duck eggs and sweet potatoes. Whisk duck egg (or chicken eggs) in small bowl until well blended. Mix all ingredients (including egg) together in a large bowl and spoon onto lightly greased cookie sheet. Bake in center (or upper center) of 350 degree oven for 12 to 15 minutes. Watch carefully — my oven baked them to a nice golden brown on both top and bottom in about 14 minutes. These are like muffins or scones made into cookies. I made this up, so you’ve been forewarned — but they were really good. Must be the duck eggs. I’m actually starting to get a bit snooty about my gluten-free baking. I’m thinking Martha Stewart should be seriously worried. Everything I’ve baked lately has come out perfect, absolutely perfect. Or close to it. Okay, close to it according to my standards. Oh-oh, what if my duck egg supplier disappears? I’m addicted, I could be in trouble without these “golden” eggs. Support your local farmer, help them succeed. If you live in northern Colorado check out Grant Family Farms and join their CSA program. Someone’s baking may depend on it. Hurry, go do it now. 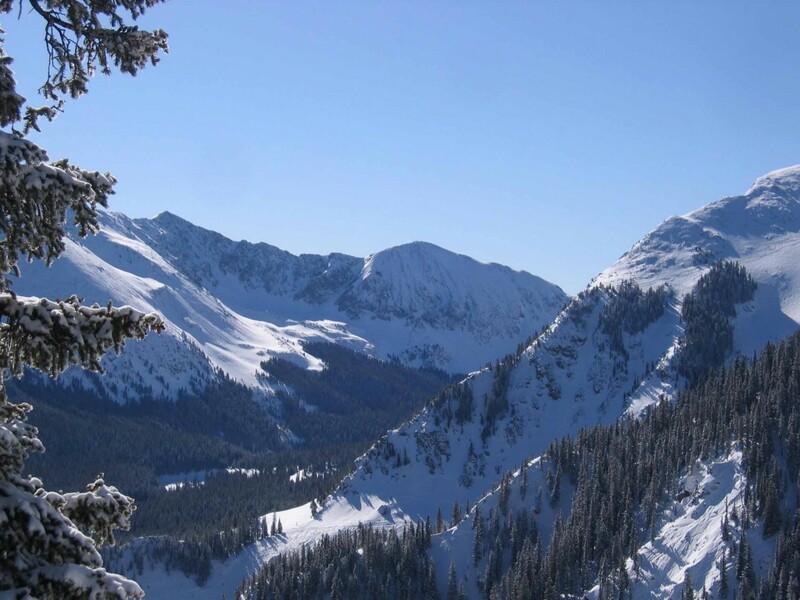 These photos were taken TODAY, Friday, March 27th — springtime in the Colorado Rockies. 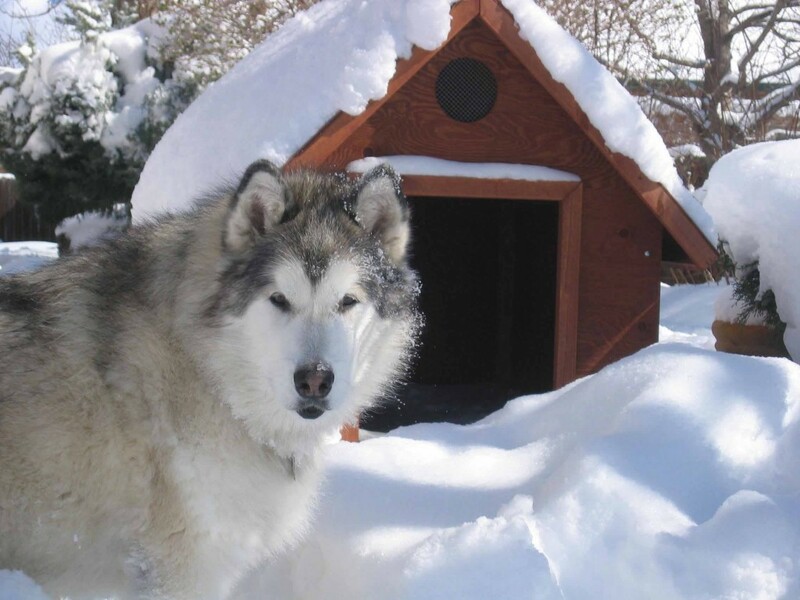 Fairbanks loves it and although I’m definitely a winter girl, I was all ready to work out in the yard this weekend. So much for that. 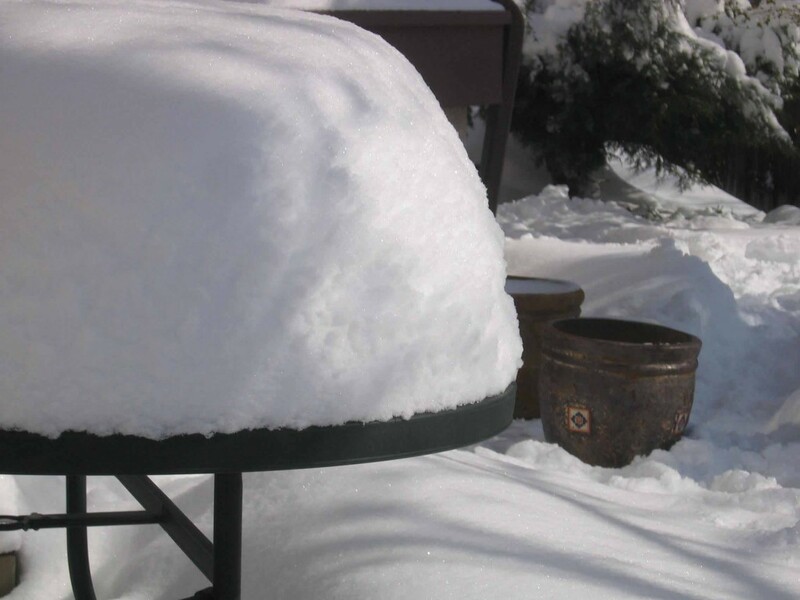 Just so you can see how much snow fell yesterday — this is a picnic table and a couple of my summer flower pots ready for plants. I should know better. At the beginning of this week we had some 75 degree teaser days. I fell for it. 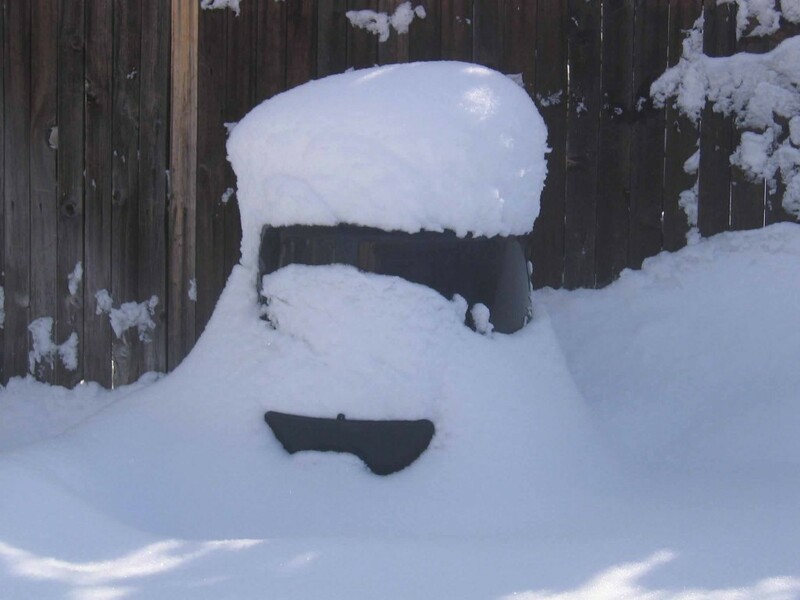 Frozen composter — and it’s a big one. I guess I’ll put away the gardening tools and throw my skis back on my car. P.S. 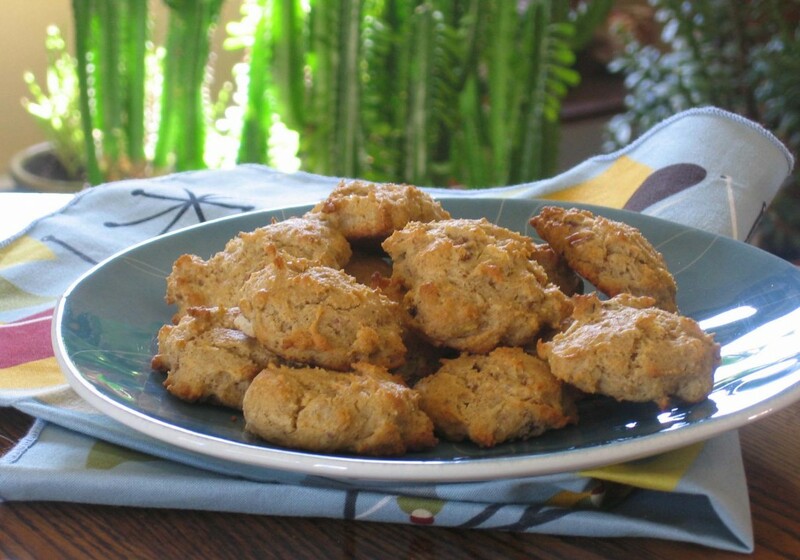 I’ll be back to food posts Monday, starting with sweet potato pie cookies. I’m a bit of a book worm. Actually, I’m a word worm, reading constantly. Not always novels though — I read science journals, magazines, text books, cook books, blogs, and lots of political stuff. Have you ever read the book Cowboys Are My Weakness by Pam Houston? It’s a wonderful collection of romantic stories about spunky women and wild men. I like Pam Houston’s writing, she’s an outdoorsy girl who lives here in Colorado, a woman after my own heart. And as much as I agree — cowboys are cute, intriguing, look good in Levi’s and blah, blah, blah — pancakes are my weakness. Actually, it’s the pure Vermont maple syrup that gets to me, the pancakes are just the delivery vehicles. If you look closely, this western pancake plate of mine has a bit of a dip in it. That way the pancakes can literally float in maple syrup and I don’t get a sticky mess all over my table. I know, I know, not exactly what you’d call nutrient-dense food. Not the best thing for balancing blood sugar levels. 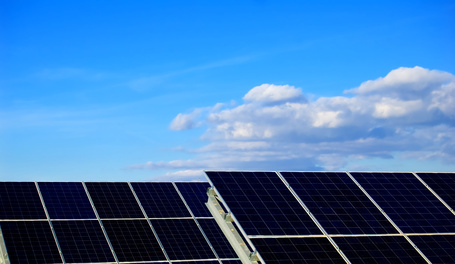 Not great for providing sustainable energy. High in calories, low in nourishment. Yeah, yeah, yeah — I know the whole story inside and out. But — Maple Syrup Is My Weakness and sometimes I just can’t resist. Not often, but once in awhile I give in and totally indulge, only to wake up after my sugar coma wondering, what the heck was I thinking?! Whisk egg in small bowl. Mix all ingredients and egg together until no lumps appear. Depending on batter consistency, you may need to add a touch more flour or milk. It shouldn’t be too thin or too thick (got that?). Pour 1/4 cup batter onto pre-heated, lightly oiled griddle (medium heat). Flip once and serve immediately. Drown in pure Vermont maple syrup, which you will regret later. Eat and take a strenuous hike to process all the sugar. Makes 2 servings, or about 6 to 8 pancakes (of which I can eat all by myself). 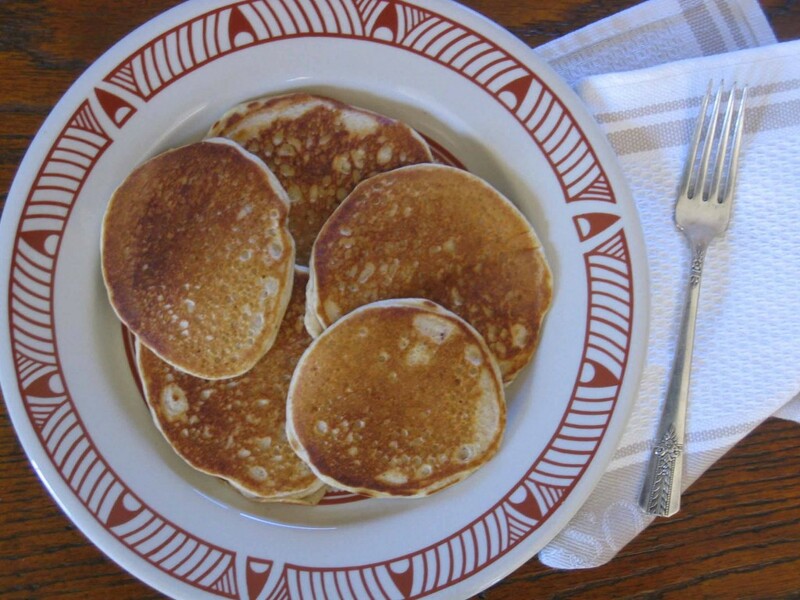 If you’re smart, you will eat two pancakes and freeze the rest for later. Reheat in the toaster. Trisha Yearwood singing Cowboys Are My Weakness from her album Heaven, Heartache and the Power of Love. P.S. For those of you who were expecting organic veggies and whole foods, that girl will be back soon. In the meantime, what are your weaknesses? Aaaahhh, nothing like a few days in the mountains to boost the spirit, clear the mind, and cleanse the soul. No politics, no stock market, no economic doom and gloom, no work, no worries. My perspective always changes when I’m outside, enjoying life, and doing something physical. Throw in some fresh powder, expansive views, lasting friendships, a little dark chocolate, and a glass of good red wine at the end of the day and nothing else matters. I’ll get back to nutrition, food, and recipes in a few days, but for now, here’s a short photo essay of my trip to Taos Ski Valley, New Mexico, Land of Enchantment and my old stomping grounds. Soul nourishment at its finest. Not fifteen minutes ago when I started on this post, my intention was to simply pick out some photos and let them do the talking. I should have known better. Blah, blah, blah — I’m never at a loss for words. 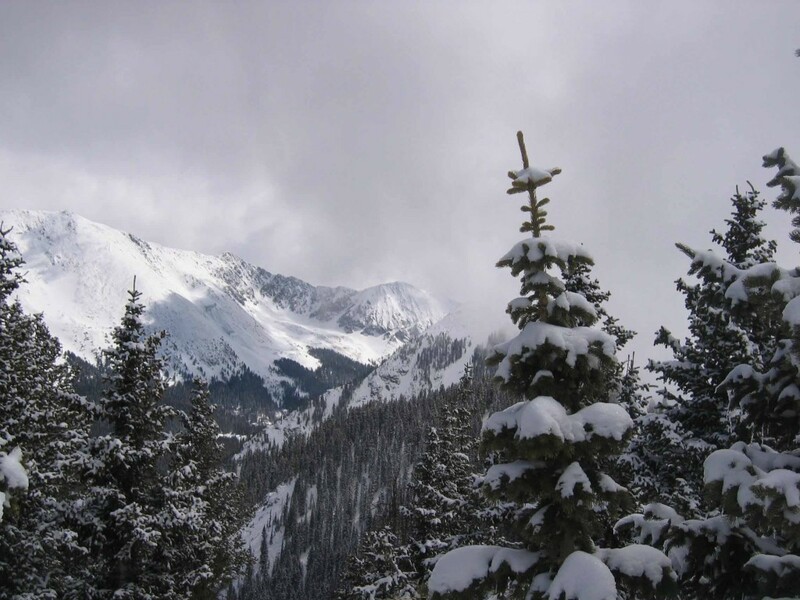 When the snow’s good (which it was), there are lots of opportunities at Taos for hiking up to some great ridge skiing. Oster, Fabian, Stauffenberg, and Treskow are runs immortalizing members of the German Nazi resistance during WWII. Ernie Blake founded Taos Ski Valley in 1955 after leaving Nazi Germany in 1938. 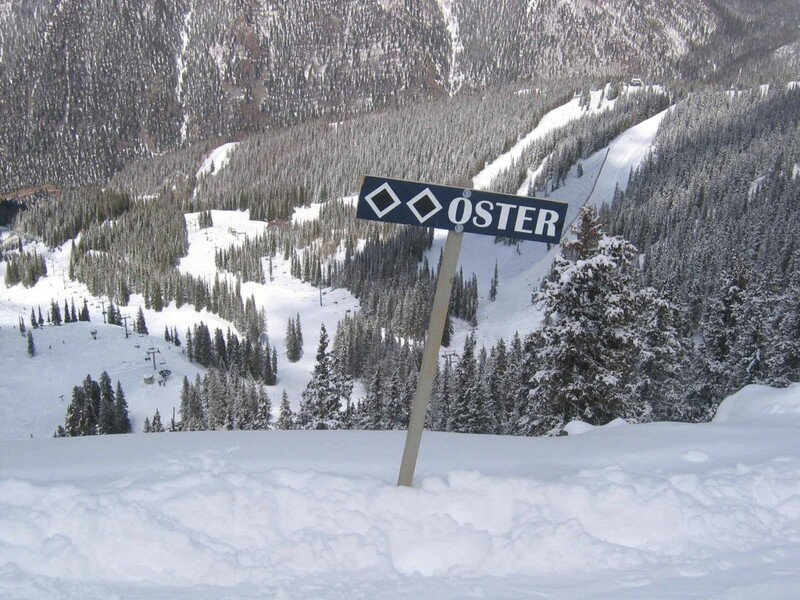 He chose to name four of the ski area’s most challenging runs in honor of these German heroes. It’s a fascinating story — read here for a more detailed version. This is me and my favorite French chef, Claude, standing outside the Hotel St. Bernard. 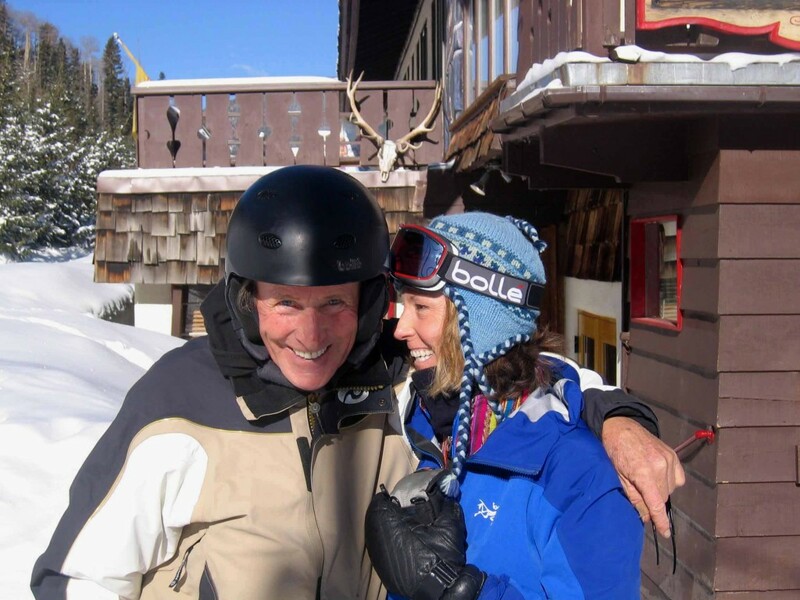 I used to work with him years ago at the St. Bernard, which, along with owner Jean Mayer, happens to be the heart and soul of Taos Ski Valley. Claude and I are God parents to one of Jean’s sons. As I said, nothing like lifelong friends to lift your spirits and enrich your life. 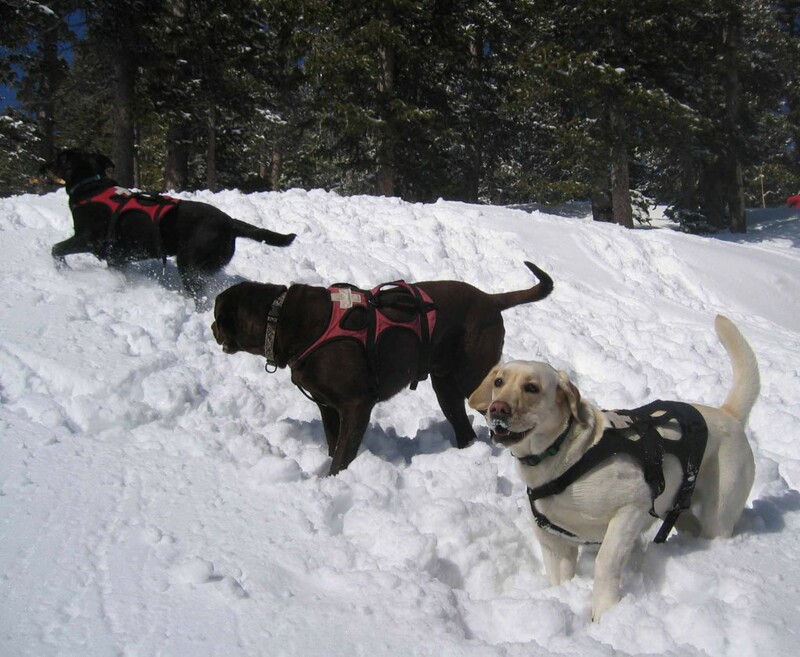 Taos Ski Patrol avalanche dogs extraordinaire — Tigger, Riley, and Hattie — off duty, chasing sticks, and having fun. Life is good for them, too. Go forth and renew your spirit! You all knew that, right? Aren’t there festive parades scheduled for your city? Here in Colorado we have prune parties and turnip green galas planned throughout the month. You can catch me (Miss Eggplant) blowing kisses and tossing Brussels sprouts from a horse-drawn vegetable cart during this Saturday’s National Nutrition Month parade through downtown Denver. It’s a big deal. Okay, so no one’s ever heard of it. Well — now you know, so let’s start celebrating. I took the above photo yesterday while on my weekly trip to the market. Yes, weekly now that I’m on a serious budget and am protecting myself from overspending on bok choy. Most women go shoe shopping when times get tough, I head for the organic veggie isle at my local market, Vitamin Cottage Natural Grocers. 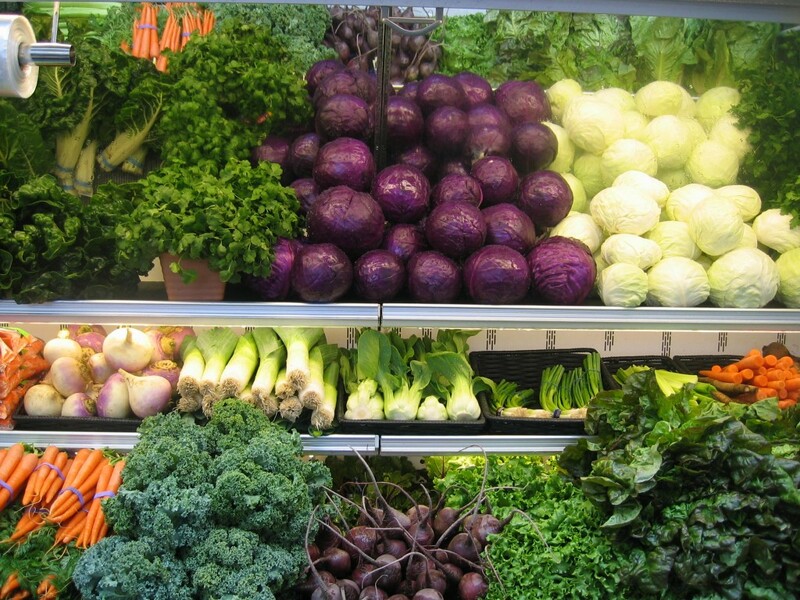 Seriously, doesn’t this produce look beautiful? I love this Natural Grocer and they’ve provided me with everything I’ve needed while I’ve been in mourning the past few months, waiting for my favorite farmers to start delivering my organic veggies and fruit again. When that happens, look for weekly nutrition tips, recipes, and information as we go through the growing season. I’m planning to post about whatever the bounty is for that week, including ways to use every bit of it. No wasting. I’m planning some good stuff for that 26 week period. Stay tuned — and join a CSA. In the meantime, since it is National Nutrition Month, check this past post I did listing my top tips for healthy eating. And for the latest information on how to avoid pesticides, check out the Environmental Working Group’s data on pesticides and human health. They also have a handy little shopper’s guide you can download and take with you so you know which fruits and vegetables are the highest and lowest in pesticides. Organic is usually the best choice, but when we have to pick and choose for financial reasons this list will help you make the best choices. They also explain in detail why you should care about pesticides in your food. Go forth and celebrate National Nutrition Month with me! So what if there’s snow on the ground. I have faith that spring will arrive on schedule and I’m planning my meals accordingly. That may be wishful thinking as I’m wearing fleece long underwear and sheepskin boots, but hey, a girl can dream. And what better way to feel light and springy than to eat light and springy food. Right? * Make sure the rice paper you choose is gluten-free (unless you’re one of those wheat-eating people from that parallel universe). Rice paper can be found at Asian markets. This recipe is courtesy of the nice people at Driscoll’s Berries. They suggested peanuts, but I chose almonds. Mash raspberries with a fork in a small bowl; stir in remaining ingredients. Working with one sheet of rice paper at a time, dip sheet in bowl of hot water until softened, 20 to 25 seconds. Arrange one-twelfth of turkey horizontally in lower third of wrapper, leaving a 1-inch border on each end. 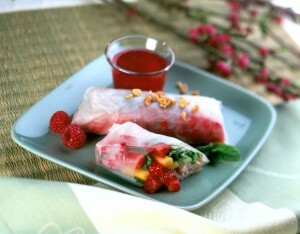 Top with one-twelfth of remaining ingredients; fold in ends and tightly roll up. Cover with damp paper towels. Repeat process. Cut rolls in half; arrange halves seam side down on serving plates. Serve with dipping sauce. Before I even start in on this, please be aware that Lindt Chocolate is NOT gluten-free (thank you to Jill at heythattastesgood for tipping me off about that). Okay, one more time, Lindt Chocolate is not gluten-free, news that came straight from the lips of a kind lady at Lindt customer service. This post is about some interesting aspects of the business side of the company, not about their products. If you want fun, nutritional information about chocolate, check out this post I did on the health benefits. As always, check directly with the company if you have questions regarding ingredients. Lindt Chocolate USA has a sweet way of going green. That famous gold Easter bunny is hopping on the environmental bandwagon. Lindt USA, which is located in Stratham, New Hampshire, is teaming up with the local power plant on a project to convert cocoa bean shells, a by-product of chocolate processing, into green fuel. Very cool. Lindt USA is also a committed partner with Autism Speaks, an organization bringing awareness, fundraising, science, and advocacy efforts together on behalf of children with autism. Lindt is donating a percentage of sales to this noble cause. As many of you may know, a gluten-free/casein-free diet often helps in the treatment of autism spectrum disorder, hence my interest in the autism community. According to Autism Speaks, one in every 150 children will be diagnosed with the condition this year alone, making it the fastest growing serious developmental issue in the US. Big, sweet kudos to Lindt USA for their concern for the environment and their support for autism research — even if their chocolate is off limits to those of us on a GF diet. Sniff, sniff. 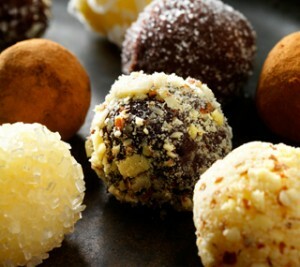 I’m on a no-sugar binge right now so I’m going to resist experimenting with these delightful looking truffles pictured above, but here’s the recipe if you want to give it a try. Keep in mind, the chocolate indicated in the recipe is Lindt and contains gluten. Just substitute with a gluten-free version. Let me know how they turn out. Wait, on second thought, not while I’m on my no-sugar jag. Oh well, tell me anyway, I want to know. I can handle it. Go forth and enjoy life (stinky economy or not). I don’t feel all that great right now (too many cookies), but I’m so thrilled with the outcome that I didn’t want to put off writing this post. I’ve been chain-eating the best gluten-free, mesquite, duck egg, chocolate-chip, pecan cookies ever made. Granted, there’s probably no one in the universe who’s ever made these before, but seriously — these cookies are prize winners. Maybe not Food Network winners, but they aren’t losers and that’s something to celebrate in the world of gluten-free baking. Actually, I take that back. These are Food Network winners, worthy of the James Beard Best Eccentric Cookie Award. Nigella Lawson would swoon over these. Ugh, but I haven’t eaten any cookies in ages and I kept testing them (over and over) just to make sure I wasn’t experiencing some sort of gustatory hallucination. Either the gluten-free god has a crush on me, I’m in a good karma phase, or it’s the duck eggs. Remember the post I did about the Grant Family Farm Bird Spa? If you missed it, you must read it as these duck eggs are wonderful, especially for gluten-free baking. Seriously, I’m in love with them, head-over-heels in love. They add texture and “depth” to gluten-free baking. It’s that gluten-imparting quality that you can’t really describe, but you know when it’s missing. I’ve made muffins, cookies, and breakfast bread using duck eggs and each time I was thrilled with the outcome. Duck eggs rock! Adding to the eccentricity of these cookies is mesquite flour. You can’t believe how wonderful this stuff is. I wish I had a scratch and sniff blog, you’d be delirious with one whiff. I’d have you hooked and coming back for more in no time. Mesquite has a sweet, chocolatey, coffee, cinnamony taste. Or something like that. I can’t quite pin-point it, but it smells absolutely divine. It gives baked goods a nice cinnamon color — it’s beautiful flour. Plus, mesquite is high in fiber and protein (especially lysine, but I’ll spare you the details) and is a good source of calcium, iron, zinc, and potassium. It also helps balance blood sugar levels. (Of course, that whole balancing your blood sugar thing doesn’t work as well when you add a bunch of sugar to the recipe. There’s only so much this little pod can do.) Ground mesquite pods were a staple for Native Americans and indigenous people of the southwest. It’s not necessary to have duck eggs and mesquite flour on hand to make these cookies, but I’m thinking that’s a good part of what made them sooo good. 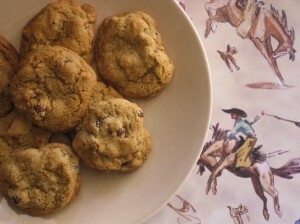 *This recipe makes about 5 or 6 dozen cookies depending on how big you make them. Store in refrigerator for 1 week or freeze for a couple of months. Gluten-free baked goods don’t last as long. 1. Preheat oven to 365 to 375 degrees (depending on the “hotness” of your oven). Place rack in center of oven. Lightly grease cookie sheet. 2. In medium-sized bowl – add both flours, baking soda, and salt and whisk to mix (whisking also aerates the dry ingredients). Set aside. 3. Beat shortening and both sugars on medium speed. Add vanilla and whisked eggs and beat until well-mixed and fluffy. 4. Add flour and mix on medium speed until well blended. 5. Add chocolate chips and nuts and hand-stir to blend. 6. Drop by spoonfuls onto cookie sheet a couple of inches apart. Bake for 10 minutes (it could take any where from 8 to 12 minutes depending on your oven, so watch carefully). Cookies should be golden brown color. Cool and store in airtight container in refrigerator or freezer. * I used to make up my own basic flour blend back in my early days of GF baking, but there are so many good options available now that I no longer bother. I used Authentic Foods Multi Blend Flour, which is similar to the foundation blend I used to make myself. It’s made up mainly of brown rice and sweet rice flours. It does contain a little corn starch, so if you have issues with corn, you might want to try something different. 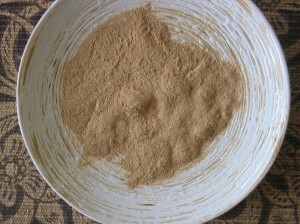 * The mesquite flour I use is an organic version from Casa de Fruta. It’s an expensive treat, but luckily you don’t need much. A little goes a long way and it stores well (I keep all my flour in the refrigerator). They suggest adding 2 tablespoons to each cup of regular flour, but I find that to be just a touch too much. I like a very subtle mesquite taste — it can quickly become overpowering. I measured out 3 tablespoons of mesquite into my 1/4th cup measuring cup and topped it off with the basic flour blend, making it 3 T in my 2 & 1/4th cup total. Does that make sense? When using gluten-free flour (or any flour, I suppose), make sure you measure correctly. Rather than ramble on about this, I’m going to send you over to Carol Fenster’s website for detailed instructions on measuring. Carol lives here in Denver, is a sweetheart of a cookbook writer, and is the queen of gluten-free baking. Take it from her, she knows what she’s talking about. First off, I’m not suggesting you eat raw teff with a fork. That would be an effort in futility as teff is the smallest grain in the world and would be impossible to scoop up with a fork. I just wanted to showcase its dainty size and figured this would do the trick. Three-thousand grains of teff weigh only one gram, but one pound of seed can produce up to one ton of grain in only 12 weeks. Got that? 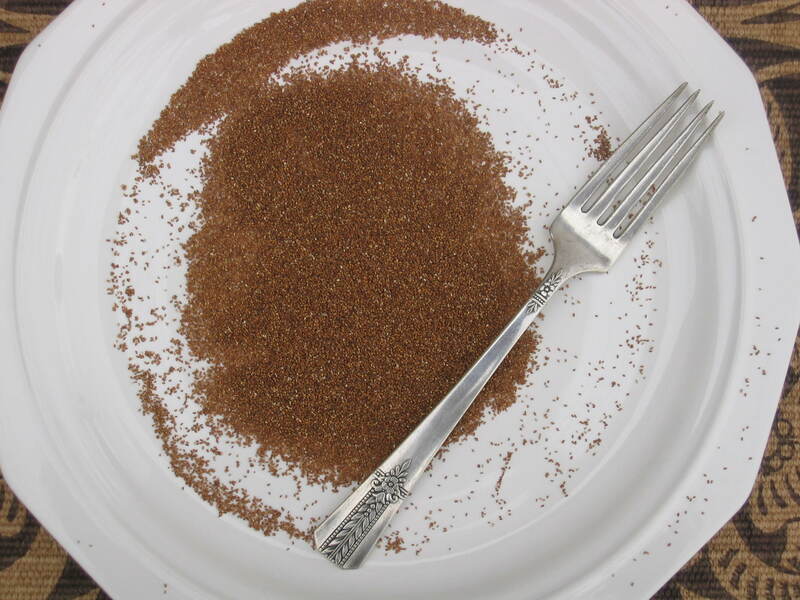 Teff is what nutritionists call a nutrient-dense food source because of its high nutrient to calorie ratio. Native to Ethiopia, it’s an ancient grain packed with goodness and rich in fiber, calcium, iron, high-quality protein, and various vitamins. It has a delicate, savory, almost herbal taste as a cooked grain and provides a rich, cocoa color to baked goods when used in flour form. The flour also has a faint chocolate flavor with hazelnut overtones. Do I sound like a grain sommelier? If I do, it’s because teff is one of my favorite grains — it’s power packed, but sweet and girlie (Zena Warrior Princess food). I use it whole to make porridge and polenta and substitute small amounts of the flour in recipes for quick breads and spiced muffins. My sources for teff are either Bob’s Red Mill or The Teff Company. Wayne Carlson, owner of The Teff Company located in Caldwell, Idaho, worked and lived with a farm family in Ethiopia back in the 1970s. When he returned to Idaho, he was struck by the geological and climatic similarities of the Snake River Valley in Idaho and the East African Rift where teff is grown. He decided to give the ancient Ethiopian grain a try here in America and now some of the finest Maskal teff in the world is grown in Idaho. I eat a mix of gluten-free oats, teff, toasted and blitzed brown rice* and chia for breakfast once or twice a week during the winter. A nutritious breakfast is a good way to start the day and helps keep your blood sugar and energy levels balanced for several hours. We also have a higher level of enzymatic activity in the morning, so breaking down, absorbing, and assimilating our nutrients is more efficient at that time of the day. That old saying, “eat breakfast like a king, lunch like a prince, and dinner like a pauper” is right. Or, in my case, like a queen, princess, and pauperette. Here’s one of my favorite winter morning breakfasts. I like mixing my ingredients — this is also a good way to use up small amounts of grains and seeds left in the bottom of various bags. It doesn’t matter, there are no rules, mix and match as you please. Use a small to medium-sized pot with a lid. Bring liquid (add salt) to a boil and slowly add grains and other ingredients. Mix well, turn heat to low, cover pot and let simmer for 15 – 20 minutes. Check and stir every 5 minutes or so and if it looks like the liquid is too low, add a small amount more. I usually end up adding a little more water as it’s cooking because I like my porridge creamy with a risotto-like texture (plus, I’m at a higher altitude). Top with a dab of honey or maple syrup and some coconut milk (or whatever type you like) and enjoy. I even add a spoonful of vanilla goat yogurt on occasion. Makes 2 hearty servings, adjust accordingly. * I use Montana GF Processors Oats (I love these guys). Oats are naturally gluten-free, but are often contaminated with wheat through growing and processing methods. Some people with celiac disease can’t tolerate oats, even the gluten-free version, so talk with your health-care provider and make your own decision regarding oats. You can also use gluten-free buckwheat groats in this porridge mix. * Toasted and blitzed brown rice makes for a wonderful hot breakfast cereal alone or mixed with other ingredients. Pour one cup of dry rice (brown, wild, or a mix) in a heavy, ungreased saucepan (I use an old cast iron skillet that was my grandmother’s). Heat on medium heat and stir regularly. Let the rice toast for about 5 to 10 minutes until golden brown. It may make some “popping” noises, but don’t let it burn. Cool, pulse in a food processor, and store in the refrigerator (use as needed). Go forth and eat a hearty breakfast.